Tigerino Crystals cat litter has a new package design. It's still the same top quality litter, just with a new look! Please note: During the change-over period your order may include both the old and the new package design. Tigerino Crystals Silicate xxL cat litter with extra large granules stops bad odours in seconds thanks to its silicate structure. This litter absorbs huge amounts of liquids and odour in a unique way and can absorb nearly its own weight in liquid. Urine, odours, and germs are absorbed in seconds. Moisture evaporates and odour molecules stay bonded in the crystals. The countleΒ micro-pores in Tigerino absorb the moisture immediately to keep the litter box dry. 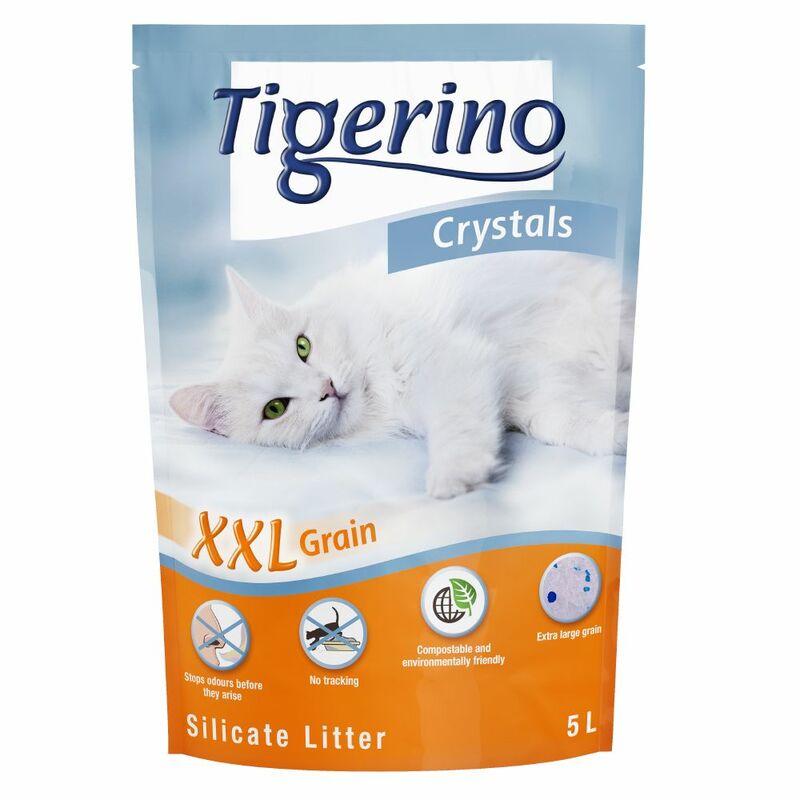 Tigerino Crystals Silicate xxL at a glance: Stops nasty smells in seconds Extremely absorbent – very light and efficient Easy to use, dust-free Anti-bacterial – germs are sealed in Compostable and environmentally friendly Very economical - 5 L Crystals Silicate xxL cat litter will last: 1 cat: approx. 25-35 days 2 cats: approx. 15-20 days 3 cats: approx. 8-12 days.